This might sound silly but what scissors does everyone use to cut their yarn? I want small, inexpensive scissors to keep with my different projects. I have one great pair of small Fiskars that I love but trying to remember which project bag it is in drives me crazy. I made the mistake of thinking Wescott (?) school scissors might be great since they were only $1.99 each and I bought 4 of them. They don't cut worth a darn. Not sure small fold up scissors are going to work either. Please help!! Working with limited funds but want to buy at least 3 pair. Thanks for any ideas. They are plenty sharp. But i bought mine a long time ago so the quality could have changed. The little tiny ones that come in the portable sewing kits are usually pretty sharp. I use Gingher 4" thread snips, they work best for me. Scissors are too time-consuming. I have a couple of pairs of Westcott Titanium scissors--about 4" long. I don't remember how much they were, but I don't think they were expensive. They were in the sewing notions section at Wal-Mart. I've been using them for several years and they are still sharp. I use embroidery scissors. They are small and inexpensive and cut well. You can get them almost anywhere. I've found the little kids' scissors work okay to snip yarn, and they are handy to keep in my tote bag, too. I hate using the really pointed ones that poke a hole thru the bag and then into my leg or even worse, poke someone else, if I haven't put them away in a case. Mid-summer, the back-to-school sales always have these little scissors on sale, and I always pick up a handful of different styles and sizes and add them to my crafting toolbox. I have several pair of really nice embroidery scissors, a few pair I use for snipping yarn, but I've found the kid's scissors work just as well. wow--timely post for me....For the past 11 years I had used a 'hand me down" little cheap pair. A few weeks ago they got so dull so I decided to throw them away and use another pair I had....since then I've gone through at least 4 different pairs and none are as good. I almost wished I saved the dull ones. I have a pair of embrodiery but don't like using them for fear of cuts. Years ago my mom crochet and one night my ex and I walked in on what looked like a murder scene...she had always sat down with her foot under her...so they jabbed her foot and what a mess. Thankfully she wasn't hurt bad but OMG...we laughed about it later. 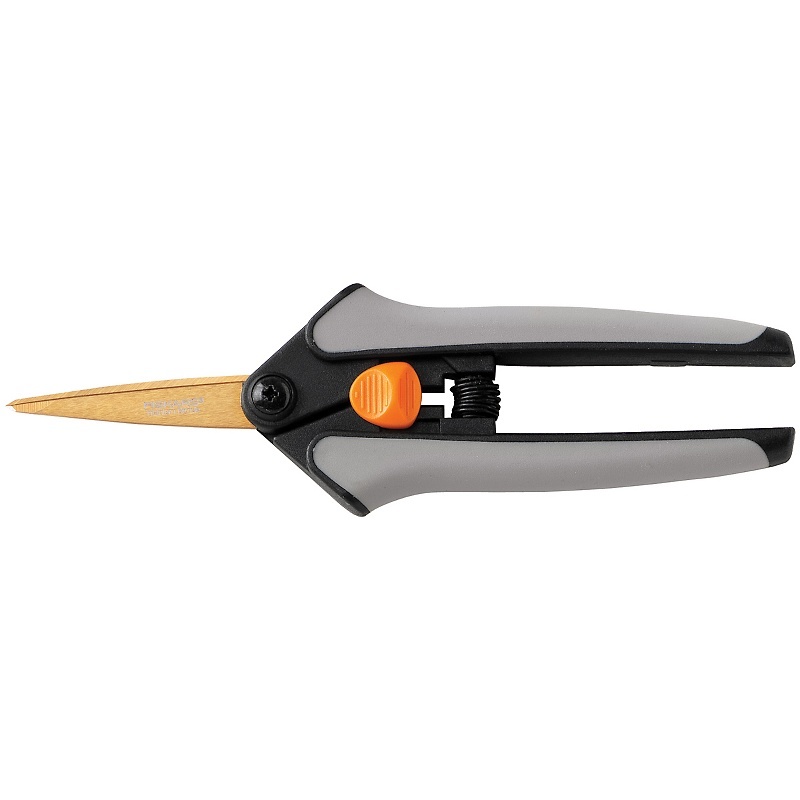 here we are, these are terrific, and sharp, and last forever...They are fiskars, the best! I keep a little kit in each of our 2 vehicles. Scissors (about 3"), stitch marker, clip to hold pattern (paper) on dashboard mat, all in a snap-shut, hard eyeglass case. I purchased the little scissors at Walmart in the Fabric/Embroidery area for about $2 a pair. They are very sharp and fit perfect in the little kits. I have those, Katie - the spring popped out of mine and I couldn't get it back in. They're still good though. I really like the stork ones. Oh my goodness!! You are all amazing. I really appreciate all of your suggestions. I have the big Fiskars, katyallen8090, and they are great but big. I did buy a pack of 4 scissors from Joann's about 4 years ago when I attempted to quilt (we won't even discuss that!! ). They have gray and purple handles and they are titanium. I keep the biggest one for cutting fabric, the medium size for scrapbooking and I've been using the 4 inch ones for crochet, when I can't find the small sharp orange handled Fiskars. They have been the best but I was trying to go smaller. The 4th pair in the set was like snips. My only problem is they stay open and they are sharp as all get out. Kind of like these - I think I'll look into what you all have been suggesting. Thanks again. You are all wonderful!! ha, my orange piece that keeps them together when not in use popped off too, a while back, I just fit a hook grip over the point when not in use though. These are like my second or third pair, and if you don't cut cardboard or something with them, they last and stay sharp a long time! I Had these too, orange ones, and they weren't sharp at all, and hard to manage, ha ha. In regard to the sharp points, I was watching an old episode of Fons and Porter's Love of Quilting this morning, and one of the tips was to use the cushion pencil grips on the tip of sharp scissors. Can't believe I never thought of this. Probably wouldn't work on a pair of snips but it's great for regular scissors. Just wanted to share. Good idea! I've got some of those pencil grips already, too. Never thought about using them on the scissors, great idea! I have a fear of sharp objects...years ago one of my teenage friends was fooling around, decided to wad up the afghan her mom was working on and use it as a pillow while we were all watching TV... yep, the crochet hook punctured her eardrum and she lost her hearing in that ear! Scared the bejeepers out of me and I've been super aware of where I leave my hooks, knitting needles, and scissors ever since. That happened almost 50 years ago, I can still see and hear her bleeding and screaming from the pain. I always leave my projects put safely in a workbasket now, even if I just leave it for a moment instead of just dropping it, it only takes a few seconds to flip it all into the basket and I don't have to worry I use different size plastic baskets from the dollar store. I always take out the hook, too, and put it at the bottom of the basket. Knitted things go in the basket needles first, and always with caps on the ends. I find the baskets work well around the house and try to keep all the tools i'm using in the basket a small pencil box. what an upsetting story, about the poor girl. That would scare me too.. I put the crochet hook grip over the blades, keeps them closed, and covers up the point. I don't know the brand and it's not on the scissors, but I bought small pairs, about 5-6" long at Joanns. I think they were about $4 with a coupon, have blue and turquoise handles. Really, I just wanted to add that I too got tired of looking for things, and went out and bought three cosmetic bags at the dollar store and set up three complete packs - scissors, stitch markers, yarn needles, H/I/J hooks, a pencil, tiny notebook - and keep one with each WIP - I usually have about three I'm actually working on at a time. It has made life so much easier I wish I had done it years ago. I don't know why it took me so long to think of it. Donna, that's a great idea. I have one little cosmetic bag that I just move from project to project. It would probably be smarter to have more than one. Guess I need to buy duplicates of some of my hooks and a couple extra cosmetic bags. Thanks for the tip. My hubby has made me several crochet hook roll-ups out of scrap material. (I know--he's a KEEPER!!) Now I have a roll-up for almost every project I have going--one for the car, one for my crochet class, one for my prayer shawl meetings, and one by my rocker!! I too use the cheapest scissors I can find that will cut the yarn and not chew on it! I like the clippers more than the scissors, for road trips and classes.